The first question you might be asking yourself: what is an intrapreneur? No, intrapreneur is not a typo, it’s an actual type of candidate. More importantly, it’s a type of candidate you should be thrilled to see on the other side of the webcam in a video interview. So just what is an intrapreneur? An intrapreneur is a candidate who brings an entrepreneurial spirit to an existing organization. For instance, your employee who started a corporate volunteering program might actually be an intrapreneur. An intrapreneur is the employee who looks at the way things are done in your organization and suggests changes to cut down on inefficiencies. They are motivated candidates and workers who bring an entrepreneurial spirit and new ideas to make your company a better place. So it’s obvious why companies are interested in luring these candidates to their open positions. These are the candidates bringing in the best fresh ideas and helping your company move forward instead of being stuck in the lurch. Every company needs intrapreneurs, from startups in desperate need of new ideas to giant companies like Google. Cultivating a spirit of innovation is just one of the reasons Google lets employees take time out of their day to daydream and brainstorm. Great! How do I find them? Finding an intrapreneurial candidate isn’t quite as easy as learning the definition of the word. 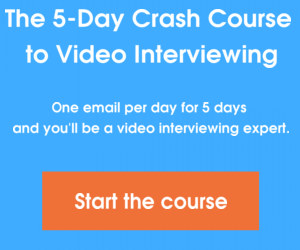 Utilizing the video interview process is a good way to begin to determine if the candidate on the other side of the screen will be someone willing to bring their entrepreneurial spirit into your organization. A candidate doesn’t become an intrapreneur overnight. The job seekers who will really bring the new ideas and big dreams to your company will be the same ones who have contributed in an interesting way to past organizations. In the video interview, be sure to ask about how they’ve contributed to past workplaces. Did they implement a green initiative, streamline a clunky process, or come up with a new service? If they can give concrete examples of their former innovation, it’s likely you’ve found an intrapreneur ready to spread their wings. Candidates with entrepreneurial spirit are also the kind of employees who are willing to get out there and take risks. These risks won’t always have paid off, but just like the saying, there truly is no reward without a fair amount of risk. Ask candidates in the interview about a time they took a risk in their professional life. Why did they take this chance and how did it work out? If the candidate talks about taking a gamble on a great, interesting new concept, it’s likely they have the creativity and the boldness the best intrapreneurs possess. A good way to test their entrepreneurial spirit, ability to take risk, and ability to think on their feet is to ask them directly in the video interview for ways they would improve your company. Timid candidates might feel uncomfortable telling you a certain system needs to be streamlined or that your company needs to work on your social media marketing. But an intrapreneur isn’t as worried about stepping on toes as they are with making the company a better place to work. If the candidate offers you some fresh ideas and actionable plans to improve your company, you might want to consider scooping them up before the competition. Intrapreneurs are the kind of employee every company wants. They’re the kind of worker with the ability to dream up the next big thing for your company. So when hiring for your next open position, consider looking for job seekers with a little extra innovation. What are some ways you look for intrapreneurs? Share in the comments!